The role of pine wood in the First Temple is described in 1 Kings Chapters 5 and 6. Construction of the Temple and royal palace complex was a huge undertaking. In addition to the 30,000 Israelite men that Solomon forced to cut trees in Lebanon, Solomon conscripted 153,600 aliens living in Israel. Seventy thousand men functioned as carriers, 80,000 men as stone cutters, and 3,600 men as foreman (2 Chronicles 2:17-18). Solomon obtained the pine for the Temple from Lebanon. Similar to the cedar trees used in the Temple, pine trees were made into boards or planks. The Temple floor was covered with planks of pine (1 Kings 6:15). The entrance to the Temple’s main hall was two pine doors (1 Kings 6:33-35). Each pine door had two leaves that turned in sockets. On the doors were carved cherubim, palm trees, and open flowers. The carvings were overlaid with hammered gold. The Bible does not specify whether or not pine wood was used for the floors in Solomon’s palace, throne room, and Hall of Justice. Because the building walls were made from cedar, most likely their floors were pine planks continuing the parallel construction of the Temple. Initially, using pine for Temple floors seems odd. Pine is designated as a soft wood in comparison to oak, a hard wood which was plentiful in Israel. 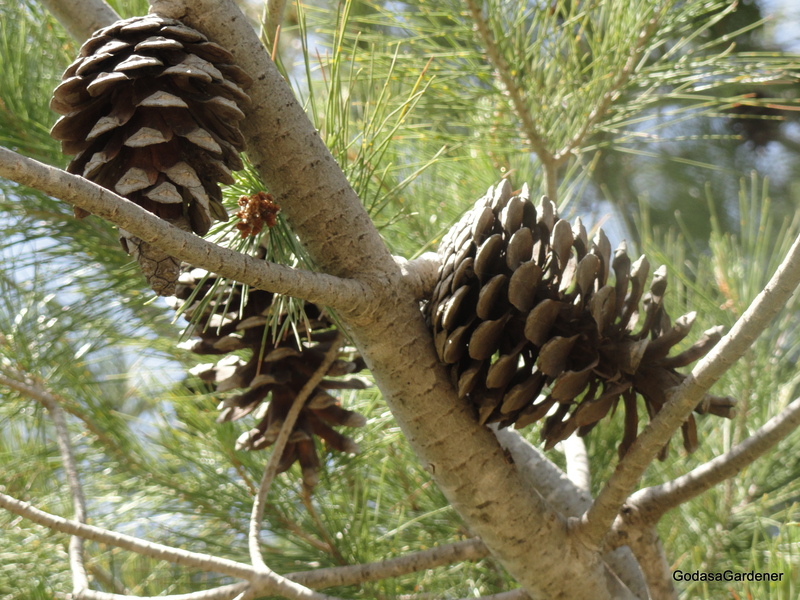 Lebanon pine trees were most likely from old growth forests. The wood would have been heart wood taken from the center of the pine tree versus sapwood at the outside of the tree. Heart wood has “died,” hardened, and ceased to pass nutrients up the tree. It is the hardest and darkest section of the pine tree. Currently, heart wood is used in pine flooring where the wood is cut with the vertical grain. Pine wood can be without knots (clear) or have tight knots or large knots. Tight knots add character and beauty to pine floors without appreciably weakening them. Heart pine ages beautifully; it darkens slightly and takes on a soft glow. In the United States, there are pine floors 300+ years of age. The floors have some gouges which add to the character of the floors. This strange looking pine tree is from the Armenian Seminary Garden in Jerusalem. It is reputed to be the oldest pine tree in Israel. The most likely candidate for the Temple pine is Pinus halepensis, known commonly as the Jerusalem pine and the Aleppo (Syria) pine. Despite these geographical names, P. halepensis has a typical western Mediterranean distribution. Ecologically, Aleppo pines are specialized for low to moderate fertile habitats and thrive in desert heat, drought, and wind. Although the Aleppo pine is tender when young; once established it can take near-zero temperatures. The Aleppo pine is an evergreen conifer that is relatively short lived at 70-100 years; however, with arbori-cultural care, specimens can live over 200 years. 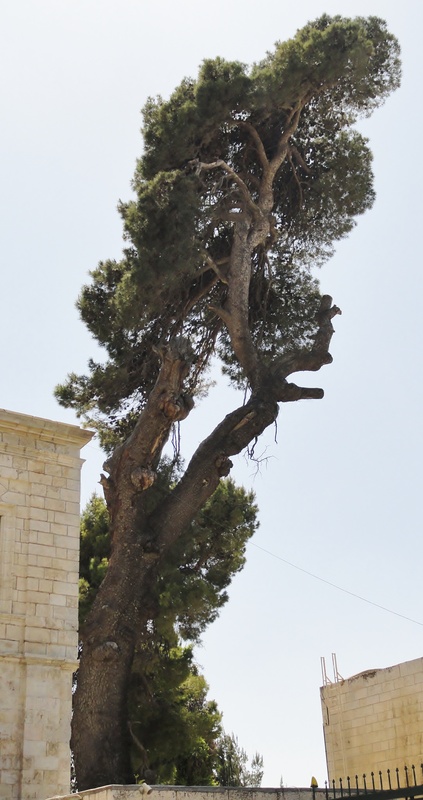 The oldest living Aleppo pine, 215 years old, is in the Armenian Gardens in Jerusalem. The Aleppo pine needle is light green to olive-green. The flower is a cone. Male cone are cylindrical and occur in tight clusters at the tip of branches. Female cones are oval to oblong, 3–4.5 inches long, reddish to reddish purple, and grow on short stocks. Pines are an emblem of nobility. In a person, noble means the person possesses excellent qualities of the mind, character, ideals and morals. In the Old Testament, certain women were described as noble. Boaz told Ruth he wanted to be her kinsman-redeemer because she was a noble woman (Ruth 3:11). A woman of noble character is described as her husband’s crown (Proverbs 12:4). Proverbs chapter 31 lauded a wife of noble character and concluded that she was worth more than rubies. Some of her characteristics included working with eager hands to meet the food and clothing needs of the household, adding to the financial security of the family by using judgment to purchase a field and making linen garments to sell to the merchants, giving freely to the poor and needy, speaking with wisdom, and acting with dignity. Over two decades ago, I was a manager in a corporation. In a managers’ meeting, a psychiatric nurse gave an education program on team building. One of his remarks was, “always look more at what a team member does than what she says.” Probably what Isaiah and the psychiatric nurse were saying was, “noble is as noble does.” Noble people are more than noble ideals and plans. Noble people produce excellent actions and deeds. Christ said “by their fruits you will recognize them” (Matthew 7:16). Reflection. Would people looking at your life conclude your deeds as noble?